Silver Spray Charters offer unique boat angling trips in Poole and beyond, to give customers the ultimate angling experience. On board their purpose built catamaran Silver Spray take budding anglers on special cod and bass fishing trips plus turbot fishing, shark fishing, wreck fishing and inshore fishing trips. Silver Spray customers frequently catch cod and bass but also experience other marine wonders such as turbot, conger eels and threasher sharks. 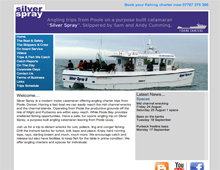 Silver Spray now offer 3 day Cherbourg Angling Holidays and 4 day Channel Island Fishing Trips to Alderney. Both are proving very popular, so phone to book your 3 or 4 day fishing break today!